Knowing real-time forage moisture is critical for choosing if and how much preservative to use, how much steam to add to very dry hay, and in predicting effects on forage quality. Real-time and continuous moisture sampling offer the benefits of robust sampling with many points and large volumes of hay or forage. Most equipment manufacturers measure moisture content in hay during baling using electrical conductivity methods. Near Infrared Reflectance Spectroscopy (NIRS) and microwave transmission geometry are alternative methods. Let’s take a look at how real-time forage moisture is determined and for what purpose in large rectangular balers. Star-shaped wheels are mounted on a hay baler, such that points of the star-shaped wheels protrude into hay being baled and progressing through the baler. In the case of rectangular block bales, the points preferably penetrate between parallel stems of the hay compressed into the bale form and are driven to rotate by the moving hay. 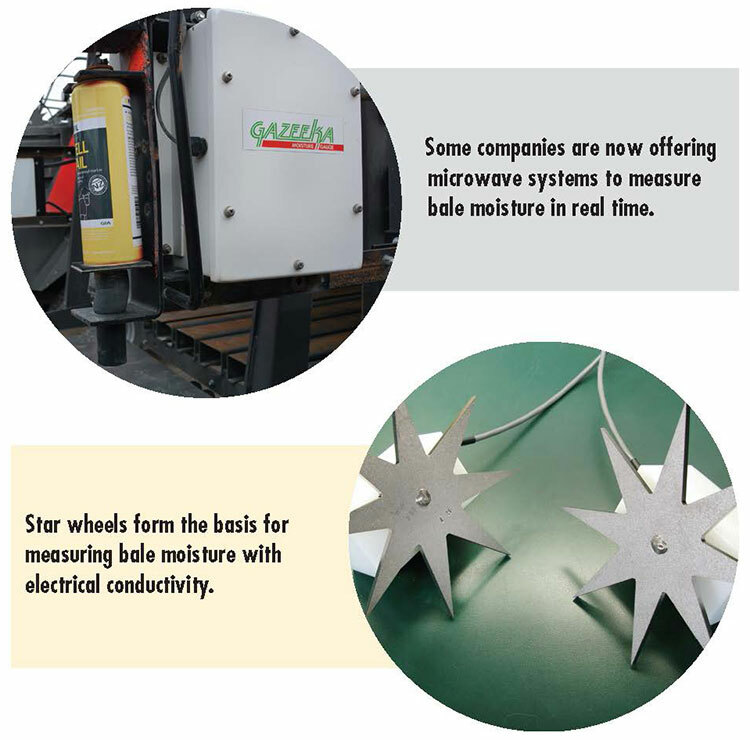 Two 7-inch star wheels are located directly behind the knotters and have a nonconductive arrangement electrically isolating the two star-shaped wheels from each other and from the metal framing of the baler. Electrical conductivity is measured from one wheel across the top of the bale to the other wheel. In this position, the wheels are in contact with 10 percent of the material in the bale. As the feeding mechanism of the baler mixes the windrow fed into the bale chamber, these wheels see a good sample of the composite moisture being baled, including the top and bottom, the center, and both sides of the windrow. Moisture is estimated by calibrations from conductivity between the wheels, while the rate of baling is monitored by their revolutions. The reading can control other processes such as preservative application or provide alternative signals such as sound or a visual indication (for example, a flashing light). Readings are accurate between 7 to 70 percent moisture. Pure water is an insulator and so relies on ions in the water to conduct electricity. These ions predominately come from the mineral salts in the hay or forage, which can vary. Near Infrared Reflectance Spectroscopy is the study of the absorption of near infrared light (energy) by molecules. In practice, the sensor shines an infrared light as the hay passes through the baling chamber and measures the light being reflected back by the sample. The moisture in the sample will absorb some of the light and, therefore, there will be less light reflected back to the sensor. Measuring the amount of light absorbed allows the calculation of the amount of moisture in the sample. The NIRS methods are based on calibrations derived from laboratory chemistry, but NIRS analysis can estimate moisture and many nutritive values with only one scan. NIRS is rapid but only predicts moisture instantaneously from a small diameter of surface material. It is highly influenced by particle size and ambient environmental effects, so its adaptation for baler application is not common. Maintaining a clean and scratch-proof lens is a major issue for the real-time NIRS. Real-time NIR is most useful when using samples neither dried nor ground and has potential to measure moisture with reasonable accuracy; it also can detect changes in other nutrients such as protein and fiber. Since the moisture peak is dominant in the NIR spectra, it is a fairly easy value to measure. Richard Kelly, Vomax Instrumentation in Australia, is the developer of this agricultural-based technology. Although there are several microwave transmitter products from industry, I only know of two sources of instruments with calibrations for hay: Vomax Instrumentation (Gazeeka) and DSE from Denmark sold by Harvest Tec in the USA. “Measuring moisture on a hay baler using microwaves requires an antenna to emit the microwaves, which is typically in the 2.4 Gigahertz Industrial, Scientific, Medical (ISM) unlicensed band. The Dielectric Constant is the ability of a material to store energy in a short space of time. Vomax conducted experiments on very dry hay bales, including the air spaces in the large square bales, and have determined a typical Dielectric of approximately 2. “In contrast, water has a Dielectric of 80. The reason that the Dielectric of water (80) is so high is that the water molecules are bipolar and are thus much more easily ‘excited’ by electromagnetic waves than the vast majority of commonly found materials that are not bipolar (such as the nonwater molecules in hay). The higher the Dielectric, the more the microwave energy is absorbed and the slower the microwaves move through the material. “Air is used as the reference Dielectric of 1. First the air reading is subtracted from the microwave signal (tared) so the remaining microwave reading is only the change in microwave signal caused by the hay bale alone. The microwave values for only the bale are then fed into a mathematical algorithm that converts the bale microwave readings to a moisture value. This process is typically carried out 50 times a second for five seconds, then the average of all these values is stored ready for display to the baler operator. “The microwave to moisture algorithm comes from years of taking many microwave readings in hay bales, then taking many core samples from the same bales and having them analyzed for moisture content in the laboratory. A regression analysis is then done comparing the microwave readings with the laboratory results to determine the calibration algorithm. In a nutshell, we are measuring the amount of water molecules that are in the hay compared to an air reading of essentially 0 percent moisture. Jeff Roberts of Harvest Tec Inc. has been working with DSE Test Solutions of Denmark to locate microwave sensors in the precompression area of the baler to reduce the lag time between the reading moisture and the baler’s pickup. This may be especially useful if the moisture readings are being used to control preservative application in highly variable field conditions. However, I am not aware of studies that evaluate accuracy of the microwave in this location with likely more variable parameters. Select a method that meets the goals of your operation. There are advantages and disadvantages to each method. The table summarizes the attributes for each system. Producers should evaluate what they want from the monitoring of moisture at baling. Even with uniform hay there is at least 2 percent variation in moisture in any windrow of hay put into the bale. If the producer simply wants to watch and make sure there is very little hay being put up over 16 percent to avoid heat damage in his stacks, a sensing system that watches all the hay and keeps that information in front of the producer while operating is going to do the job. If an operation relies on preservative a lot of the time and has significant field variations in terrain, possibly the microwave sensors located in the precompression chamber would pay for their additional cost. If the hay is being steamed, the microwave sensors located at the back of the bale chute are the only sensors that give accurate readings so that enough, but not too much steam is added. The next leap in on-line moisture measurement in hay bales is to measure the bound (stem) moisture and free (dew) moisture independently. Disclaimer: The products mentioned are not a complete list but are some of the most commonly used moisture testers. Mention of a trade name or proprietary product is not an endorsement of that product over similar units from other manufacturers. This article appeared in the April/May 2017 issue of Hay & Forage Grower on page 18.